Essence introduced some really cute lip balms some times back. This lip balms are available in 6 different shade and flavors with delicious names which are Strawberry Cheesecake, Apple Pie, Cherry Brownie, Mint Drop, Mango Ice cream and Berry Cupcake. Today i am going to share my thoughts on Essence Glossy Lip Balm in Mint Drop. Sweet lips: The pampering, light formula of the glossy lip balms in fresh colors give your lips a gorgeous shine and it has a delicious fragrance, too! fruits are mixed with sweet delicacies to create fabulous flavors. 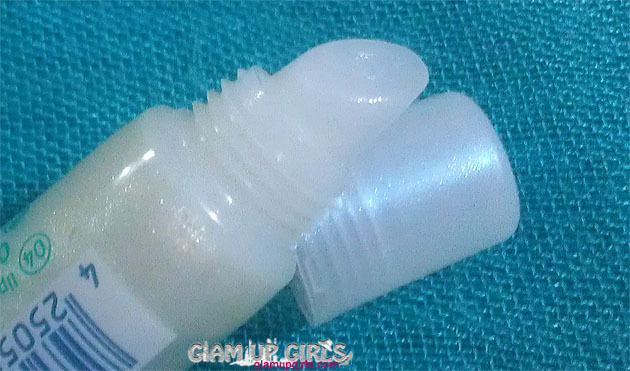 This lip balm comes in small plastic tube containing 8ml of product with angled nozzle and screw cap. The nozzle help balm to spread evenly on the lips. The texture is thick and creamy containing a lot of shimmer with no specific color. The smell of this balm is fresh, sweet and minty but not overwhelming but very light. The balm is very light weight and moisturizing. This particular lip balm is more of colorless with shine which is why i choose to pick this one then other colored options because some times you just want your lips to look hydrated and shiny. You can even use this lip balm on your matte lipstick to give them some glossy effect and keep hydrated specially in winters.The moisturizing factor is good, it will make your lips soft and hydrating as long as it is on your lips. It will ultimately be absorbed in lips leaving little shimmer behind. The staying power is ok, without eating it can last 2 to 3 hours which is good for lip balm in such price. Overall this lip balm is transparent colored, glossy and hydrating with shimmery effect. Comes in beautiful little cute packaging which travel friendly and angled nozzle help balm spread evenly. Essence Glossy Lip Balm in Mint Drop is priced PKR 240 and available on all leading stores in Pakistan.